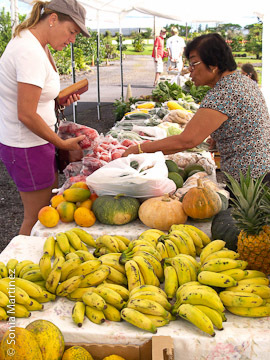 The Farmers Market at The Hilo Coffee Mill has the distinction of being the only farmers market found on a working farm in East Hawai’i. The market grounds are graced by the farm’s collection of chickens, milling around and scavenging for treats, while visitors shop, eat breakfast and enjoy live entertainment. Located on 24 acres, The Hilo Coffee Mill farm’s beautifully landscaped property consists of several acres planted in coffee and tea as well as fruit trees; gardens featuring native plants and some non-native ornamentals; chicken coops; a drying shed and the farm’s coffee roasting building; and the central building which houses a café, coffee tasting bar and gift shop. 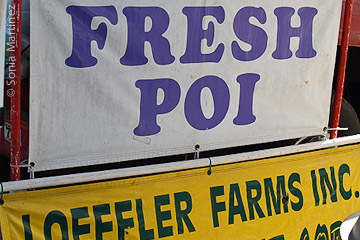 Waipi'o poi sold by Loeffler Farms together with fresh corn, fish, and other produce. We have visited this market several times since their opening in December 2009 and find that there is always something different or new going on. The Market @ The Mill features live entertainment by area musicians, usually from 9 a.m. until noon, and also a freshly cooked breakfast prepared all morning on their large portable griddle. The breakfast offerings change weekly but always use local, farm-fresh ingredients and locally baked breads. As an added courtesy, they ask whether you have any dietary restrictions or allergies caused by any food products. Market owners and coffee mill business partners Katherine Patton and Jeanette Barcia stress that all fruits, vegetables, fish, poi, plants, animals and crafts sold are from Hawai’i Island, neighboring islands or are value-added Hawai’i products using some local ingredients. Grant Turner of Puna Specialty Gardens is one of the original vendors since the start of the market and is a fountain of information on landscaping and plants. A collection of ti, vireya, orchids, non-invasive bamboos, specialty cannas and other plants can be seen in his booth. 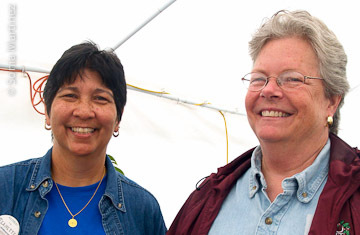 Loeffler Farms of Mountain View is another vendor that has been participating at The Mill market since its inception. Fresh corn in season, fresh fish (‘ahi, aku and opelo) as well as dried opelo and fresh Waipio poi are some of the products you can find here. Charles Magee, aka ‘Haole Boy,’ mans the booth for the Loeffler Farms. Another regular vendor is the Papa’a Palaoa Bakery from Mountain View owned by Eric Cox. “Handcrafted” oatmeal bread, three-nut whole wheat bread,cranberries and nut whole wheat, and chapati are just a few of the delicious breads you can pick up from Shirley Curl who runs the booth for the bakery. 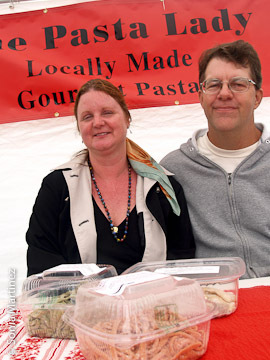 The Pasta Lady Cynthia Bologna with Ken Cutting. Jessica Ferracane shops for veggies and fruit. The Hilo Coffee Mill booth offers not only their own brand of freshly roasted coffee, but also their own fresh eggs, papayas, avocadoes and bananas. In addition, they sell freshly made salsa, coffee-coconut tapioca, coffee flavored syrup and toasted coconut candy. All the value-added products are made on the Mill premises. Partner Jeanette is in charge of ‘cooking on the griddle’ and preparing breakfasts. This time it was an omelet, a coffee-marinated grilled beef, fresh fruit and a thick grilled slice of Papa’a Palaoa Bakery’s Three Nut Bread with a big dollop of butter. Other Saturdays the offerings can be Burracos, made with farm fresh eggs, Portuguese sausage and bell peppers, wrapped in a locally made flour tortilla; or “Huevos Rancheros” and other egg dishes, always served with locally grown fresh fruits. Cost per stall/booth: $10, with first week free. Free 100% Hawaiian coffee for vendors during market hours. $1 off breakfast. Current Products: Fruits and veggies, plants, bread, jams and jellies, cookies, pickled mango and veggies, handcrafted pasta, macadamia nut butter, waiwi furniture, local breakfast cooked on the griddle, syrups, candy, salsa, eggs etc. Products desired: We’re pretty diversified when everyone is there. Because we’re small and local, some vendors have chosen to come every other week. Also, it’s hard to find farmers who want to come and spend their Saturday mornings at the market. They chose to sell to companies like Hilo Products and restaurant direct and don’t have the product or the time to spend sitting at a farmers’ market. Special Events: Often live entertainment, 9 am to Noon. Sonia Martinez, the Hawai'i Homegrown Food Network regular farmers market reporter, is a cookbook author and freelance food writer for several publications in Hawai'i, including The Hamakua Times of Honoka’a. She is a contributing writer for Edible Hawaiian Islands Magazine and has her own food & garden blog at soniatasteshawaii.com .